Before Joe Strummer became a punk icon with the Clash or the patron saint of rock 'n' roll that he has become since his death, he was just another British musician trying to knock out a hardscrabble living with a local band. In Strummer's case, this band was the 101ers, a better-than-average group of rockers that have found a degree of infamy mostly through being eclipsed by the Clash's considerable legacy and Strummer's significant solo work. A loose-knit collection of 101ers' material was originally issued on vinyl back in '81 and by various fly-by-night operations in varying forms and formats since. The expanded Astralwerks collection, Elgin Avenue Breakdown Revisited, provides the final word on this important, if historically slighted band's legacy. Formed by Strummer in 1974 near the end of the British pub-rock era, the 101ers were much closer in spirit to bands like Ducks Deluxe and Dr. Feelgood than anything that would follow during the punk-rock explosion of '77. Inspired by the music of Chuck Berry, Elvis Presley, and early Rolling Stones, the 101ers practiced a street-smart brand of R&B drenched, guitar-driven rock 'n' roll that would later inform some of the Clash's London Calling and later musical output. The 101ers never put out a proper album, however, and released only one 7" single, making Elgin Avenue Breakdown Revisited a ragtag collection of rough-hewn studio demos and rare live tracks. Fans of the Clash expecting the spit-and-bile proto-punk of the band's first two albums will be sorely disappointed. Fans of Strummer, though, who appreciate the artist's wide range of talent and musical tastes, will certainly enjoy the raw charm offered by these rare 101ers songs. Especially significant are Strummer's first attempts at songwriting, tentative steps like "Keys To Your Heart" or "Sweet Revenge" that sound surprisingly mature. Blending a classic Chess Records R&B sound with strains of rockabilly and roots-rock, the 101ers weren't a half bad band by any standards, and Strummer's early songs easily stand with similar efforts from notable songwriters like John Fogerty or Bruce Springsteen. 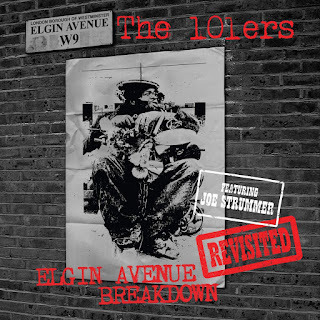 Elgin Avenue Breakdown Revisited also includes a number of previously unreleased live tracks, including originals like "Keep Taking The Tablets" and "Lonely Woman's Son," one of Strummer's first socially-conscious songs that would later be recreated by the Clash. A number of live cover songs are also included, from the obvious (Chuck Berry's "Maybelline" and Bo Diddley's "Don't Let It Go") to the obscure (Slim Harpo's "Shake Your Hips") and the unusual (the Stones' "Out Of Time"). A glorious performance of Van Morrison's garage-rock standard "Gloria" closes the disc. Big Star’s 1974 WLIR sessions resurrected!